Wind turbines present an ever-present danger to not only eagles and other birds of prey, but also to any migratory bird that passes through areas where wind turbine farms have been constructed. 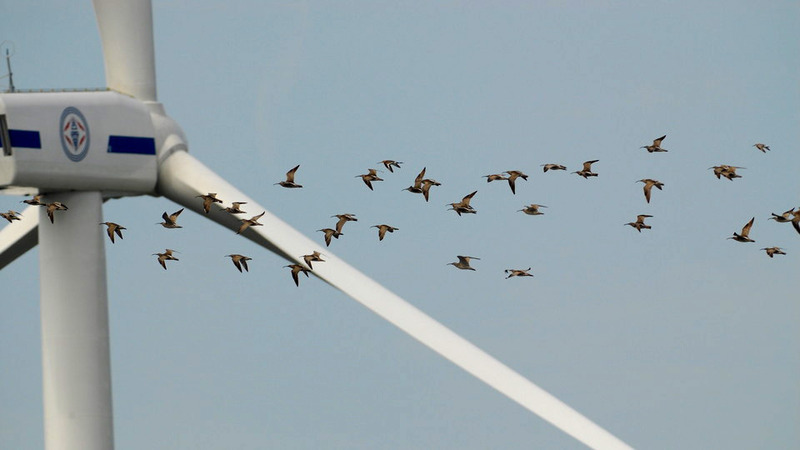 A 2013 study published in The Wildlife Society Bulletin found that wind turbines killed an estimated 573,000 birds annually in the United States. And that figure was 4 years ago. According to U.S. Wind Energy State Facts ( Oct. 2016), there are over 52,000 wind turbines installed across 40 U.S. States plus Puerto Rico & Guam. Most people do not realize how little energy is actually derived from these wind turbines. For calendar year 2016, Wikipedia states that wind power in the United States amounted to only 5.55% of generated electrical energy. The goal is to have these turbines produce 20% of generated electrical energy in the U.S. by 2030—and one can only imagine how many more turbines would have to be built with an incalculable risk to birds. An even more alarming fact is that the data on the number of deaths is gathered by paid consultants to the wind industry. That’s the fox guarding the chicken house. At the infamous Altamont Wind Resource Area alone, more than 2,000 Golden Eagles have been killed by the wind turbines there. Since the diet of Bald Eagles is primarily fish, when wind turbine developers begin constructing wind farms on our coasts or near lakes or rivers, the mortality rate for Bald Eagles will skyrocket. We cannot let this happen. The size of each traditionally designed industrial wind turbine is staggering. An average tower is 212 feet (but can go well over that), with arms 116 feet long – that’s an enormous area that is covered as the blades rotate. During construction of a wind turbine, roads often have to be widened or built from scratch; mountain tops are sometimes blasted away to create a level area of at least 3 acres, so that the platform can be stable enough to support the enormous weight of each turbine assembly. “Wind turbines may now be among the fastest-growing human-caused threats to our nation’s birds. Attempts to manage the wind industry with voluntary as opposed to mandatory permitting guidelines are clearly not working. Wind developers are siting turbines in areas of vital importance to birds and other wildlife, and this new data shows that the current voluntary system needs radical improvement”, said Dr. Michael Hutchins (now deceased), former National Coordinator of American Bird Conservancy’s Bird Smart Wind Energy Campaign. The American Eagle Foundation joins American Bird Conservancy in supporting Bird Smart wind energy development, which involves careful risk assessment leading to appropriate siting; independent, standardized post-construction monitoring of bird fatalities; mitigation using effective, tested methods; and compensation if federally protected birds and bats are killed incidentally. The number of birds taken annually by wind energy facilities (not including associated power lines and towers) has been estimated to exceed 1.4 million birds by 2030 if there is no change in U.S. policy toward wind energy development. In December, 2016, a new eagle-management plan announced a final rule by the federal government that would give wind energy developers 30-year permits to “take” or incidentally kill protected Bald and Golden Eagles, without requiring the industry to share mortality data with the public or take into consideration such critical factors as proper siting. The so-called Eagle Take Rule, finalized by the U.S. Fish & Wildlife Service, puts many thousands of the nation’s protected Bald and Golden Eagles at unacceptable risk. The American Bird Conservancy – as well as a host of other environmental agencies – have requested that the U.S. Department of the Interior develop a National Programmatic Wind Environmental Impact Statement (EIS) to identify appropriate areas for wind energy development as well as areas where development should be avoided completely to conserve federally protected birds and protect especially sensitive habitats. ABC was subsequently told that the Department of the Interior and FWS did not have sufficient funds to undertake such a project. Supporting the development of clean, renewable sources of energy such as wind and solar power to address climate change is admirable, but such development must be done responsibly, with minimal impact on our public trust resources, especially federally protected species such as Bald Eagles and Golden Eagles. If wind farms are to be created, we must make sure the farms are placed in areas where there will be the least negative impact to eagles and other birds. ABC has identified 10 of the worst-sited wind energy projects in the United States. The listed projects—five already built or approved and five proposed—are located throughout the United States, in California, Hawaii, Kansas, Massachusetts, Missouri, New York, North Dakota, Texas, West Virginia, and Wyoming. Some of these projects have a long history of causing bird deaths. All illustrate the risks of poor siting and the limitations of current mitigation strategies. Are Some Designs Better Than Others? Look to Hawai’i’s Approach! In Hawai’i some areas are completely off limits to wind development. State and federal officials have declared the island of Kaua‘i totally restricted for any wind energy development due to the presence of many endangered species. This forethought and planning have been lacking on the mainland. Again, Bald Eagles will be seriously impacted when wind turbines are placed around the Great Lakes or other major waterways, because fish is their main source of food. In July 2016, a radar study was released by the U.S. Fish & Wildlife Service that confirms wind turbines on the Great Lakes pose an unacceptably high risk to migratory birds and other wildlife. Proposed projects in New York, including the Lighthouse Wind facility, raises a red flag of alarm, as reported in a press release by American Bird Conservancy, Wind Turbines On The Great Lakes Threaten Migratory Birds. This concern is echoed by the Rochester Birding Association in New York, stating that “due to its siting within 5 miles of the lakefront, [this project] will cause significant risk to migrating birds. Up to 71 turbines are planned along the south shore of Lake Ontario, and these turbines are 570 to 620 feet tall. That is twice the normal height! The Fish & Wildlife Service currently recommends that wind turbines should not be placed any closer than 3 miles of the Great Lakes shorelines; the American Bird Conservancy recommends 5 miles. However, the recent FWS radar study indicates that the minimum should be extended to perhaps 10 miles from the shoreline. Can wind energy ever be bird safe? Libby Sander of the American Bird Conservancy, in an article dated Jan. 5, 2017 discusses this topic. New designs advertise they are “safe for wildlife.” The technology comes in all sizes, shapes, and appearances. They all say they can harness the power of wind and create energy without killing birds. In one, giant sails funnel wind through a central turbine; in another design, wind is funneled into a tube, increasing speed. There is a definite need for innovation, but rigorous scientific empirical evidence over the long haul is needed to authenticate the claims of any new design. A startup in Spain called Vortex, however, has recently come up with a new design for the turbines. More Information. 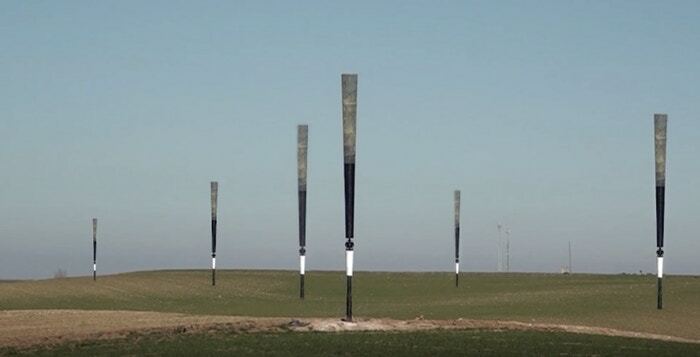 The bladeless turbines are massive poles jutting out of the ground. Because they’re thinner than a regular wind turbine and have no blades, more of them can fit into a space, meaning more electricity can be generated while taking up less real estate. We cannot allow the progress we have made in restoring the Bald Eagle to the skies of America to be undone by the inappropriate siting of wind turbines in areas where Bald Eagles congregate in large numbers, such as the Great Lakes.” He continues, “It’s heart-breaking to think that we’ve spent more than 20 years releasing a total of 150 juvenile eaglets from our Hack Tower on Douglas Lake, many of which migrate to the the most heavily populated eagle areas in the US, and that all of our repopulation efforts could be undone in less than a year, without penalty. If one could see how much love, devotion, passion, and funds go into each and every bird that we hatch, raise, and release at our facility, they’d understand how devastating it is to us when even one of these beautiful creatures is killed by a poorly sited, poorly designed wind-turbine, with the owners of that turbine not even batting an eye. We have to do something. If you are aware of a future wind turbine development, garner support from your community, region, and state. Wind turbines affect birds of prey, but they also implicate other non-environmental issues, such as interfering with cellular connection and becoming an eyesore in otherwise beautiful landscapes. There are many reasons for a group of people to want to prevent a wind project in or around a community. Groups you can support where Wind Turbines are being considered: Rochester Birding Association (remember, AEF eagles that are released from our Hack Towers migrate right into this area!) Find out from them what you can do to help, particularly if you live in the Lake Ontario area. Wind farms are being proposed in these areas and have been identified by ABC as among the Worst Offenders, with explanations why each has been listed. If you live in any of these areas, get involved!